This image shows the East direction. In this "Vastu for East" section we will discuss about "vastu dosh remedies for east facing house", benefits, advantages, disadvantages and dosh nivaran methods, pros and cons, tips, easy remedies, problems, and different structures etc. East direction has 90° (Ninety degrees) as per the directional compass. This direction is ruled by Lord Indra. East direction is in between the Northeast and Southeast. North is always showing on top and east shows on the right in maps. This is the international standard. For some convenience purpose, some people show variation in directional maps. 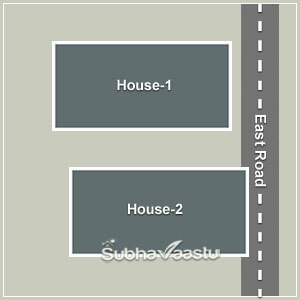 If there be road towards East of a plot or house, such property is called East plot/house. This shows it's effect predominantly on the male members of the residents as also on name and fame of the family. It is suitable for entrance, pooja room, prayer room, living room, dining room, study room, conference room, family room, bathrooms, swimming pool, water storage sump, septic tank, lawn grass, flower pots, foyer, court yard, home office room, guests waiting room, drinking watercan placement, library, TV location, showcase, male children bedroom, meeting hall. In some places, this is also called as Poorva, Purva, Thoorpu, Suryodhaya Disha, Surya Disa, Ravi Disha. Further, we will discuss the advantages/benefits, disadvantages, effects and defects. Then we will decide how this direction is good or bad. Why many famous Vastu Consultants recommending this direction to residents. 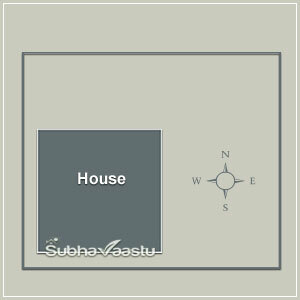 Before going below please check this House vastu link to understand better information on houses. 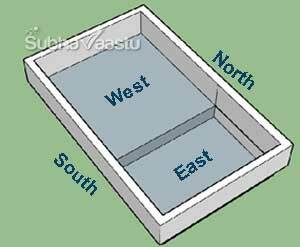 When coming to the directions subject "East" direction is having priority influence in vastu shastra. Sun raises from 'East' direction, generally "light" means it through away the devil, dark, fear, ill-health. Light welcomes confidence, strength, energy, health, courage, happiness etc. By knowing many more hidden powers of East our elders said it is having such a huge concern healthy effects to humans. One should know that health is wealth. 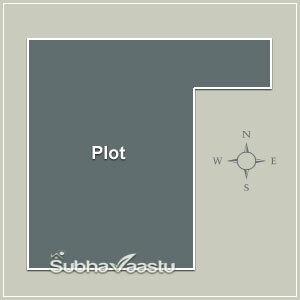 Just by reading some Vastu books some Vastu Pandits continuously recommending this plots/homes to the residents. Once we go through our articles on West and South directions, then residents interest may be amplified to buy only West or South facing Flats. 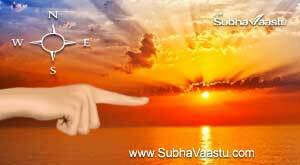 As per Hindu cultures, Sun is said to be visible ‘God’. Most of the Indian cultures and customs invariably linked with morning Sun rays. It is also called as "Pitrusthana" (fathers place), so it should have more open space and should be low in flooring and should not be filled or covered and if do so, resulting in the lessening of male progeny and it becomes a house without a male child. We prepared this animated image for your easy understanding purpose. One animated hand shows the East direction of the home. This is the East direction or East part of the home. This hand starts from Northeast to Southeast. In between these two corners, the entire area becomes East. Raising sun is also visible in this image. Please check the directions link which is at bottom of this page, we published one image which shown how to find the directions. Below we are discussing the effects of various problems in this East direction. 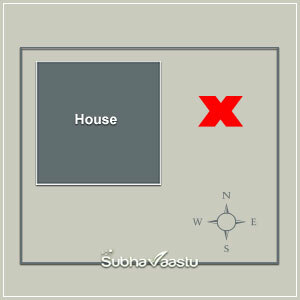 To know more about how to find out the East direction homes, then this image helps you, in this image foot marks move towards SUN way, the house is facing towards Sun, then the house is called as "East facing direction house" or "East house". It is easy to observe the house directions by seeing this house. The footsteps move towards Sun, the road is towards this direction, so the house is called as "East Facing House". This road is called East road for this house. In some areas, this house is called as West facing home, but their statement is not correct. Sun is the root of the productive means on earth. The whole real physical world formed of fragments is regulated by the rays of the Sun. That is why our elders worshipping the Sun as God (Surya Bhagavan, Suryadev etc). The Modern common man, who need all the scientific reasons for everything and elaborately asking the questions why should Sun to be treated as God. He finally decided that Sun is the potential source of heat. He never accepts Sun as a God. He disbelieved all the faiths that Sun as a God. Sun's covering the surface is about 6,000 Kelvin, which has approximately 5,726 degrees Celsius (10,340 degrees Fahrenheit) and the Sun diameter will be 1.391016 million km. The Sun is 13,91,000 kilometers (8,64,400 miles) across. It's almost 109 times than the diameter of the Earth. The weight of the Sun is about 3,33,000 times than the Earth. Almost 13,00,000 planet Earth can be fit inside of the Sun. Many Scientists proved about countless positive benefits of Sun rays to the human body. It is said that sunbathing or basking in the morning sun after applying any vegetable oil to the body, which helps to develop the formation of "D" vitamin in the human body, which has a therapeutic impact on diabetes. The radiance of Sun formed of seven colors developing a rainbow viz. , violet, indigo, blue, green, yellow, orange and red and this aspect is made use of in the nature cure which is generally chosen for healing specific ailments, Not only these, there may be much more tremendous and immense precious invaluable energy of the sun. That is why our forefathers and ancestors had impersonated Surya Namaskaras, as alma medica for best strength and physique. With the notable progressive development of this Vastu science, man has started building the homes as per its principles and tenets, thus the decisive and positive impact of 5 elements viz., sky, water, light, air, and earth would be realized. Home is the inseparable factor in the life of the human. Later on the complete facts has been effectuated and this deftness of science is grown evolved about it, which is called as Vasthu, the most effective source for getting peace and development for human beings. Due to the all above argument, this direction is said to be most important for humans health. Generally, East facing homes will get such a feature, that our elders already described that health is wealth. It is proving nowadays. By knowing these features, our elders came to the decision that open space at East direction is considered to be auspicious. And most of the vastu consultants recommending the residents to buy the East direction when residents raising a question "Can we buy East facing home" or " Is East facing house is suitable to us". Though the idea of the vastu consultants may not be wrong, the blind decision never makes everyone and everything happy. Need to observe many things and afterward, only resident has to take the decision in the presence of competent vastu expert. Extending towards East direction is auspicious. Can buy adjacent east plot/site to merge it to the existing house/plot, but some conditions apply for this extension, read below. 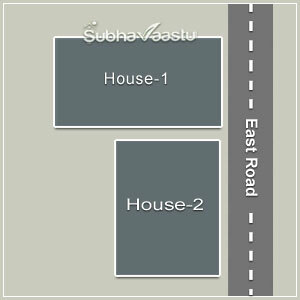 If a resident already resides and wish to buy the connected/adjacent East direction plot is auspicious, but it has to be decided only with the proper guidance from Vastu Consultants. Otherwise, the existing North doors become Northwest doors, or, the existing South doors become Southwest doors. Measurement of new extension plot is most important here. For example: if an existing house plot has 100 ( approximately 31 meters) feet from East to West direction and you are buying the new extension East plot like another 100 feet. In addition to this, if there were any street focus on the existing plot with the house, they also should be factored before deciding to buy the adjacent east plot. For example, if there were a Northeast-north street focus with the extension of the plot of the east it might otherwise become, North-northwest street focus, which brings in enormous instability in the lives of residents. Further, if there was a well or water body in the Northeast side the same would become well in the North-Northwest side which again disastrous. These will have to be properly evaluated and only a competent vastu scholar can visualize and then advice correctly. Mere textbooks statements of extension in North-Northeast and East are beneficial is correct with a caveat. Be cautious in this extending principles. Do not be anywise and pound foolish. If on such extension the level of the composite plot becomes such that East level becomes higher one can imagine the failures one does face in this like. What happens if the East direction is lower level / depressed. Balance in vastu is important. To understand this subject easily, read the below small content for easy understanding. Balance to the body is most important, if there is a stomach at top and head at the middle then human being may not walk properly, likewise, God kept human stomach at middle part and kept the head at the top. By this intelligent structure placements, the human is easily moving from one place to another place otherwise he may fall apart. Balance is most important everywhere and everything too. Most of the residents or people need a scientific explanation for everything. Without scientific reason, many cannot listen to theory and cannot accept the same. Here in Vastu shastra, there is a lack of researchers and innovators. 99% of the present vastu consultants interested to read books and recommending the bookish knowledge and vastu tips to the residents. If there is proper research took place on this science, then definitely every vastu rule can be proved properly as per the present science. We are all aware the higher we go the more unstable we become. Because the gravitational force of earth which binds us with itself becomes less and less. We all desire virtues good conduct and benevolence stay with us at all times. If the directions which bestow these qualities are at a higher level, ipso-facto, it means that these virtues are unstable and undesirable phenomena. It is for this reason that lower levels for these 3 directions (East, Northeast, and North) are recommended. Not only this we are aware that in case of storm dirt is raises and goes away but water would stay back. This would mean, apart from levels if water bodies such as bore well, well, water sump, are in these directions, it enhances the chances of virtuous qualities staying and bestowing their benevolence on us longer. Many people give various reasons as to why these 3 directions should be at a lower level. Perhaps, these may be empirically derived by them or intuitively explained. It will be a welcome feature if they explain the logic behind the statement of advantages of these directions being at a lower level so that a rational thinking person would appreciate this fact. In this image the land elevation and depression floor level is clearly shown. East floor is lower level than the West direction land floor. This is said to be auspicious. It is also possible to do this same system of correction inside of the home too. But need to get proper advice from experts advice before doing this correction. This image prepared for readers understanding purpose. This direction should be broad, and at a lower level / depressed state (Lower level) than the other directions except for the Northeast corner. For better results, East direction should not be blocked by any structure or building. Sun raises from this East direction and getting warm waves, those waves have directly hit the homes, those homes may become rich in health, fame and many other benefits. No need to worry about other directions. The important point of this direction is, it affects on the male or male progeny. Those homes who does has more sunlight at mornings on East direction or the properties has more East direction, it states that the progeny born with knowledge, or knowledgeable people reside in those homes. Wisdom is their wealth. Servant maids room is suitable to fix at Northwest or Southeast, don't plan their room at northeast or Southwest. If there be street towards the east of a plot or house, such property is called east plot or east house. This shows its effect predominantly on the male members of the residents as also on the name and fame of the family. If eastern portion if fairly at a low level and extensive in nature, the residents will generally enjoy a contented life and may even be role models to others and lead a successful life. If your western neighbor builds his home close to your plot, your fame will spread far and wide and you will enjoy an excellent state of health. However, then they should not have borewell/ well towards their NE. In the same way, if your southern neighbors build their home fro your south border, it is benevolent to you. However, in their house, they should not house well/home well to their NE side them. Build a house with a possible balcony on the east side. (This should, however, be such that there be no construction on the east, ENE an NNE side. Aids long progeny, prosperity, name, and fame. Build an east slopping Verandah such that NE is not constricted. This aids health. Open space towards north aids prosperity. Female folk will enjoy sound health. Along the west wall build full slid platforms. This helps in overcoming adverse situations. Indebtedness would disappear and aids financial prosperity. In the east plot, having a low level in east side is greatly beneficial. Lineage would progress and prosper (when due care is taken in the construction). More open space towards East direction brings luck and fame to the residents. Planning to have more East direction open space to the residences may generally brings happiness to the residents and lineage may be intelligent too. children will progress well in the chosen field. More over providing more open space at North direction than the South may brings more money and good health to females too. Lesser open space towards West and more open space towards East is the right method to bring positive powers to home. Build a compound wall such that the West side is higher and a bit thicker as compared to east side. If politicians live in such houses, they will have recognition in the political field and status too. At no time the west compound wall be shorter and a thinner when comparison to east side. At the worst they may only be equal. Study this image carefully. Here there are two plots. One NE (Marked as "1") and the other east plot (Marked as "2"). We are now discussing the east plot and not NE plot. If you build in your east block, leaving no open space in the north (in effect upto the extreme north of your property), the residents of NE plot would benefit (and may not be you). If however, you leave adequate space in the north during construction, the NE residents would not enjoy such bonus. This image is only for your understanding purpose. Check this image carefully once again. If Northeast block people built a huge compound wall (on their Southern side, which is your North side), it can as well be cause for concern. It however both of you build a first compound wall, then to take due care wide building the south side compound wall. If, the NEW neighbors do not agree for a common compound wall and build their own, it is incumbent upon you to build your compound wall separately (away from their compound wall) at least 6” apart). If your NE neighbor builds his house without building a compound wall, (up to southern limit) even then you should home your own compound will attempt 6” away from their construction. If a house is built like this way, the residents will be prosperous, hence a happy life and a home which is indeed an ideal one. In such houses, vastu complaint home aids in children education and their progress. Residents will get good name in the society, their fame will improves. They will have confidence. They live peacefully, things go smooth, the business runs as per expectations, they never go beyond their limits, they decisions will be right or they will take right decisions, have adequate money. Water wells are suitable in this direction. Water storage sump is also preferred to place, but decide it only after getting proper advice from experts. Can plan for the septic tank at this location, get proper guidance from expert. The males of this home will be physically strong, if the sewage or rain water is passing through this direction. If this home has slanting roofs or projections or slab or verandah or balcony, then it improves the health of the male members of the family and wealth wise also they are strong. Some homes has sitting platforms at this direction, this may be very useful for the family members to sit and chitchat, but these paltforms or dias or pials should be below the lower levels of the home inside floor level. If these sitting pials were not elevated than the floor level of the inside home Northeast or East direction then it brings prosperity and peace. More than the double open space of the House at East direction and it is in a lower level than the West direction then male members of the house will come early to the home and will get satisfactory life and had good health and wealth too. Their word has more respected in the society. Many people will come and get suggestions from them. Suitable for the politicians. If the home main entrance door is facing towards East direction, this could be treated as propitious. Further, this door is facing slightly towards the Northeast, then there is a chance to gain a sound position of finances, peace, inheritance succession lineage, affluence. If a home has tall apartments at West and South directions, water body at North direction, sufficient open space towards East direction, house constructed at Southwest quadrant, having Northeast main gates will become an ecstasy heaven or elation paradise. These are rare in India but will be available in other countries, one has to keep an eye on the properties, they will get these kinds of homes. These featured house does not have any good value in Norway. "WAIT FOR 5 SECONDS HERE FOR ANIMATION EFFECT". Have you heard about "East corner", yes it appears when the plot is skewed. Some argued that "there is no East corner", "East is the direction it never be a corner". For them we are publishing this image, in this image we can clearly observe East direction become EAST CORNER, this happens only when the plot is inclined. This is animated image, in this image when the directions become 135° then East reached to Northeast corner. When the directions become 45° then East reaches to Southeast corner. We can find these kind of properties in many places, for example, Karol Bagh in Delhi. Coming with results, this could be decided only after observing the measurements. Normally, 45° provides good results, 135° is not giving good results. Please note that this is only approximation without stating the measurements of the site or home plingth area. Water falls towards East is accepted. Coming with fountains, get idea from an expert, without his recommendation don't take any decision. If you need more information on this fountain info then click this fountain position as per vastu link. Fortunate are those who are endowed with such plots/houses. This home has extended ENE. There is allowed development in such place. If the house is built, due care being taken as per Vastu Science, there will be exponent progress to the residents. (If resident got such a plot, please do consult a competent Vastu scholar so that the best of result may be obtained). In such plots, building a house such that appropriate open spaces (such as more on east and north and less on west and south etc. ), is the best principle. Sun rays come from this direction. This direction provides vital power to living things. Our sages also doing all the rituals are performed by facing this direction only. Hence, it is called as a holy direction. Lord 'Indra' blesses development in education, status, happiness, vigor, interest in luxuries, professional development and success in business also observed. Had safe professional carrier, development and improvement. Their wealth improves well and higher respect in their society. They will be blessed with good children and enjoyment, are assured. This direction is responsible for fame improvement, progress in business, industrial development etc. In positive effects section we discussed about Door facing towards Northeast and East. If the door faces towards Southeast, then there may be a chances of court litigations, thefts or robbery, poor or poverty or may be chances of encounter small fire accidents. If there is no open space at East direction and more open space at West direction then there may be a possibility of mental disturbances, tragedy, mentally or physically handicapped, breaking of the lineage, possibility of losing kids,(not applicable for USA, UK, Australia properties and some parts of India), defame, besmirch, sully, lack of intelligence, thinking for unnecessary things, trying to get a key for the unsolvable problems, always trying to find a solution for obscure complicated things, fighting to solve the uncertain and unintelligible things, money losses, living in dreams etc. Based on many other surrounding impacts several effects of these may increase or cutback or diminish. If the compound wall in east is higher than in the west, ill health in the family may manifest or some other shobby or substandard things may also happen in the family. Please note that the difference in height means, not 6 inches or one feet. Elevation here means, more than one feet. If the house is very bigger one like one acre land, then even 2 feet height also could not affect on the inhabitants. For east houses, in no case there be ditches in the west side, now it shall lower than the eastern part. If, on the contrary, if be so, the head of the family would court incurable ailments/diseases or some times may leading to death even. Where there are kids, care should be taken that there be no accumulating dirt, garbage, pebbles and stones etc towards east or north east. Or else, it may effect the health of the kids. Financial losses also are possible. If Eastern Southeast is extended it bodes all round ill will. Due to sudden events in life, one may even loose sense of discrimination and supper greatly on the account. Children may not come up in life. Financial losses. Ill health and chronic ailments. Bad habbits will improve, accompanying with bad friends and hostility improves, heavy expenditure ventilates, health may spoil, quarrels in the home or in the society, this results in loss of name and fame in society and one way have to even hear adverse comments about self when in the company of others.. Need to consider the extension of Southeast-east, based on that extension only the negative impacts will escalate. If there be heavy weights towards east and not to towards west, there is a clear possibility of financial ruination and loss of prestige name and fame, life become uneasy. If there is a problem or any obstruction was made of to the East facing homes then residents may face hypnagogic or they may be very lazy in future. What happen if trees at East direction. After reading some text in websites and vastu books, some residents thought this is bad feature, if one really feel like so, then do one simple technique to keep the trees alive and not cut in the name of Vastu. Here is the tips. plant more trees at West direction. Dig one water sump at Northeast or East direction after the trees. So the water sump will be in between trees and the house. Make sure the master bedroom is at Southwest. If there is no trees at East direction and you are planning to plant trees, then postpone it or plant trees at West, South and Southwest directions. Hight raise and heavy buildings at East direction, generally, this may not be good. Some times and in some places this rule may not works when the property is in cities. Because in cities we can found many buildings in and around, so the negativity will be shared to all. Only one property never be affected with this East high raise buidings. In villages or small towns it may affect badly. East side apartments, these heavy structures may not giving good results. What happens if there is one apartment, two apartments, high raise apartments etc. 3 floors apartment is not giving any trouble if the house is two storey building. High raise apartments for example 5/6/7/8/9 or more, then troubles may start. Getting bad name, starting health problems, things cannot go smooth, for even small things also need to use high power, starting complications, eye problems starts slowly, starting money problems, diminishing the fame, unrest, kids will become physically or mentally handicapped, has to experience the poverty, chronic ill-health, mentally retarded or mentally disturbed. It may definitely disturb their peace, they never have good sleep, they lost confidence, further, there is a high chance of doing committing mistakes(definitely). Nowadays somebody is doing a new job by observing Vasthu by reading one or two books and doing corrections as published in those books, the practical knowledge and theoretical knowledge is very different. No comparison. Here two houses are towards East facing, these two homes are called East facing houses only, both two homes are rectangular, but length of House-1 is different and House-2 length is different towards roadside. The house-1 is little bit good for males. It may bless with good name, please note that both houses are good, but house-1 is little bit upper hand or more good than house-2. If you have house-2, don't cry. Nothing bad happens, and this is also a good property. In House-1, there is a high chances to provide more open space towards East direction, in House-2 its lesser chances to provide more open space towards East direction, that is the difference in between these two homes. If both homes do not have the compound premises and entire plinth area is constructed then both homes will be the same. No upper hand and no lower hand. Observation is very important, sometimes rules and regulations may have little variations when coming with Vaasthu, for example, a house does have the compound wall and a house does not have the compound wall may not be providing same results though they constructed with same Vasthu principles. We may observe little variations in terms of results. The good or bad effects of the neighborhood may be different when coming with the home with a boundary wall and without boundary walls. Our elders says constructing the compound wall is auspicious to the property. But this rule may not applies in all countries. 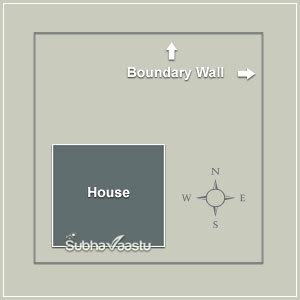 House-2 is encroached the road, as per Government rules, it may be wrong, but as per vastu shastra penetration is benevolent when the house encroaches towards east direction. Due to this encroachment, this "House-2" gets Northeast-north and Southeast-south street focus. Both street focus are good to this property. It augurs well. Please note, we are all respected people and cultured, should follow the laws and rules of the respected land. The House-1 is also good but does not have Northeast-east street focus and Southeast-south street focus effects. Some residents raising the questions their both homes are same to same, but results wise differnce, here is the answer for them. Professionals examine is different and layman perception is desperate. Like such a way, there are many other things too, that we have to observe and consider before buying the property or constructing the home. Maybe the star of a person may also involve in buying the property. This is the suitable place to discuss about one incident. While in our property review, gone to one village near Kadapa district, there is two friends by name Krishna Reddy and Ramana Reddy, both were good friends. Krishna Reddy dependably a decent organizer, and he hunt down for an expert vastu consultant and thereafter he got up one vastu specialist information and taken the consultancy and constructed the home. But Ramana Reddy does not like such concept and honestly speaking he don't want to waste his money in the name of Vastu Shastra. Krishna Reddy started the home and completed successfully. On the same way Ramana Reddy also completed his home and both joined their homes respectively. Later Ramana Reddy observe many negative changes happening in his home and he compared the results with Krishna Reddy home. When the problems were too much he never waste a day and contacted the expert which Krishna Reddy sought consultancy and asked him to visit his property. Krishna Reddy encroached road, Ramana Reddy also encroached the road. Krishna Reddy got Northeast-east and Southeast-south street focuses, while Ramana Reddy got Northwest-north and Southwest-south street focuses. The logical point here is Ramana Reddy home is "West facing" and Krishna Reddy home is "East facing". Immitation in other things may be profitable, but it won't safe in vastu. Let us discuss on this mistake, how to handle this issue. Whose mistake it was. After examining the cruel situations, Ramana Reddy wants to demolish his house even to nullify the negative effects. Anyway the problem was solved with demolish the front room and removed the street focus problems, actually, he wish to demolish the entire home, but expert saved his money by just removing only one room. Here who was suffered finally. Though by knowing the benefits of vastu consultancy Ramana Reddy don't like to have vastu consultancy, he wish to save consultant fee. Finally what happens. Who got gigantic misfortune. Let us we all think on this. 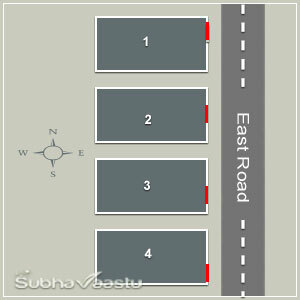 Vastu for East facing home is exclusively contrasting with West facing house vastu. We experienced one Vastu for East facing house in USA, which has a mountain after the road, after buying that home, they went with atrocious outcome consequences. The resident read some vastu books and observed vastu videos and bought the home. His wish of saving experts fee was successful, but his life was in trouble. Brainy residents never follow this cheap technique, they will first approach only the experts in this field, it's the reason they got success and called as successful people. More open space towards East is auspicious, in this image also, we can observe more open space, but the home constructed at Northwest quadrant. Due to this North will have lesser open space and South has more open space. Finances loss, health problems, quarrels, wrong decisions, expenditure, mental strain, mental tortures, uneasy in the life, no good relations in between members, debts, loans, credits, pressures from financial institutions, litigations etc may be possible here. But, those who construct their residence neglecting this direction either by ignorance or indifference, will definitely lose their wealth and fame. Their career or Trade will be affected. They will have more worries and problems, and also regarding their children’s education, profession also be affected. Slanting roof towards East is good, the roof or sheets should flex towards East direction. East provides Renaissance / rebirth of fortune is possible in terms of opportunities, Capture them, East is best suitable direction to have good name and fame. If defects found towards East direction then it maltreated residents. Those who have more East space they will conquer all of their problems. One Satyanarayana of Mysore (Place Changed), Karnataka state, suffered losses in his factory, his brother-in-law informed him “better to consult one experienced Vaastu consultant and get suggestions from him”. But Satyanarayana is a different character, he thinks that vastu consultant needs fees to observe the property, why should pay fee, immediately he bought two Vaastu books in the market., overnight he reads those books and known everything in vastu shastra., early morning he met mason (mestri) and ordered to do some corrections in the factory, wonderful within a very short period his factory seized by the financial institutions, alas! he lost respect in the society, after discussing all the things with his brother-in-law and finally contacted one experienced vastu consultant and done some corrections to his house and factory also (factory is seized, but outside, there is opportunity to visible for observation), he done the alterations as per vastu expert advise, after passing days he got some financial support from one of his best friend settled at New York (United States of America), anyhow finally he gained by vastu corrections. So the right corrections or right observation saved humans. Reading books and taking the decision may ruin the good future. If at first he approached an expert, no way for seizing the factory and loose the name in society. Once bad name came, generally, it takes years to get stamp out. Generally, business people get loans only on by their name and character, once they lost faith or trust or name in the market it's very big challenge for them to get loans, somebody searching loans from other towns or cities, because of their situation. never see few dollars for vastu consultation charges, they know all the gimmicks of cheap vastu consultancy services. Because they are educated. They never fall into the traps of quacks. It's the reason they are sustaining in USA, Australia, UK. This image has 4 homes. 1, 2, 3, 4. All homes shows with gates which marked with small red color line. Number 1 home has Northeast door, which brings them peace. Number 2 home has exactly East door which makes them successful. Number 3 and 4 homes had Southeast-east doors, which always creates many tensions, heavy expenditures, health disorders, failures, education breakups, quarrels, wrong decisions etc. So if anyone thought that all East homes are good, then this is the best example to understand. Please note that we should not consider all east homes are good. There is a lot of litigations on every direction homes. Only expert can pick you a quality home for your happy future. 1. Is water wells, water lakes, ponds, stream, rivers, torrent in East direction are good? Ans: Yes, this is a good feature. 2. Can we plant Trees in East direction? Ans: If at present, no trees, then don't plant trees in East direction. If already trees are there, then construct one huge rock platform in the west direction or plant heavy trees at West direction. Please don't cut the existing trees at East direction. 3. Apartments or huge Buildings in the east direction executes any harm to us? Ans: Generally, apartments or big buildings or heavy structures may not be good in East direction. That is why all vastu experts teach that construct the home with vastu principles. If so, things may not be wrong in the future, if there are huge constructions in the eastern direction. 4. Proposing to buy one East facing plot, opposite there are multiple open vacant sites, is this advantage? 5. Found one huge water tank opposite to our plot, (big storage structure on 8 pillars), is this good? Ans: Water feature is good, but the water tank with pillars may not be good. In such case, as a remedy, keep everything clean and clear in and around of that pillar area, ensure that there should not be any bushes, then it broadcasts to heal the negativity. 6. Can we construct septic tank in East direction? 7. Looking to buy a plot which has mountains and hillocks in East direction, is this good? Ans: No, absolutely not good. 8. Having electricity power polls and transformers are good? Ans: Electricity polls are not at all a problem, but the electricity transformer may not be good at this orientation, generally, it may not damage hugely, but it is not recommended to be placed at this orientation. Instead of east, plan to place this transformer at Southeast. 9. Having water storage sump (below ground level water tank) is good or bad? 10. Is east facing home good for rent? 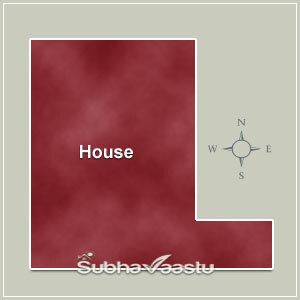 Ans: If vastu of this home is good then can enter into rental agreement. 11. Can we plan basement/cellar? 12. Can we construct car shed or car garage, can we keep vehicles for parking,? 13. Having the entrance gate or entry door or window is harm to us? Ans: Nothing to worry, certainly it is good, plan for very big windows at East direction. 14. Can we have a home office in this direction? 15. Placing the pooja room is tolerable? Ans: Sure, you can place puja room. 16. Planning for a garden is a good idea? Ans: Absolutely, good, It boosts positive energies. 17. Having an external or internal steps/staircase is acceptable? Ans: Southeast staircase is acceptable. Based on the construction system, sometimes this may not give troubles. Usually, the east staircase is not counseled by experts. 18. Lift or elevator is acceptable? Ans: Yes, acceptable on some grounds. Please check this elevator vastu link. 19. Can we keep a treadmill? Ans: If there is no place at Southeast, then keep the treadmill here. 20. Can we construct the shops? Ans: Don't construct at Northeast corner. Shops can be constructed only at Southeast to the east only. Don't block Northeast in the name of shops or other structures. 21. Keeping mountain rocks or unused bricks in this direction is OK? Ans: No, no and NO. If there is unused bricks or mountain rocks then remove them and keep them at Southwest or West or South directions. 22. Having the sewage line makes unpleasant? Ans: Commonly, this won't deliver any troubles. 23. Constructing a toilet in the east direction is acceptable? 24. Having porticos is good idea? 25. Can we plan for master bedroom? Ans: Not accepted. (This point is not considered for homes in USA, UK, Australia, Norway, and New Zealand etc countries). 26. Forming stocks room or storeroom is good? Ans: Some residents already had them, but we never recommend. Keeping southeast kitchen utensils is permitted to keep at this place. We never accept to had an independent storeroom at this location. 27. Can we plan for a water fountain? Ans: Definitely, but the floor of this water fountain should not be elevated than the common floor, it can be either depressed or even the same level compare with common floor level. 28. Constructing a balcony is acceptable? 29. Cabana or pergola is acceptable? Ans: No. But can had sea Bumbershoot or parasol or sea umbrella which should be movable. 30. Having a kitchen at east direction is good or bad? Ans: Perfect beneficial direction for the kitchen is either southeast or northwest, if both directions are not ample then can plan kitchen (kitchenette, galley, cooking area). Open kitchens are acceptable in USA, UK, Australia etc countries. 31. Having Lanai is a good idea? Ans: On certain conditions accepted, but highly recommended to have proper guidance from the expert. 33. Our floor is height/land elevation, road height, is this good feature or bad? Ans: West elevated floor is perfectly good. 34. Lower levels, depression or lower roads, is this attribute is acceptable? 35. Keeping sofa sets or other furniture is bad or good? Ans: Flawlessly high-grade choice idea. 36. Constructing labor quarters or having a servant maid room is bad? Ans: Constructing labor quarters is not recommended, but having a servant maid room is not harm. Maximum try to arrange another room instead of the east room for servants. 37. Having east street focus to the home is good, can we buy it? Ans: Lot of argument is still going on this question, please check this link before taking any decision east street focus, don't do any mistakes with street focus. Residents should not compromise on this feature. Please, ought experts opinion. 38. Having a computer table is recommended? Ans: No problem at all. 39. East truncation or cut is good? Ans: There are many questions arising with this question. Get experts guidance or check this inclined homes link. Based on the structure style, it is accepted and some times it is not accepted. For "U" shaped structures east truncation is not a problem, for other styles of structures it is suggested to get advice from specialists. 40. Can we extend East direction? Ans: If extension including the Northeast then it is acceptable. 41. Where should we plan for conservatory? Ans: This orientation is very good for conservatory, you can also plan for depressed floor level. It will get very good sunlight. You know about importance of Sun rays and sittig before Sun at morning times. When conservatory planned properly, residents will go here regularly and will get sunlight and sun rays. Good for health too. Which is the best location for Kitchen? Where should we keep Pooja Mandir in office? Vastu consultant in Oregon, need vastu consultancy? Is two cot bed are good or single cot bed is good for couple? 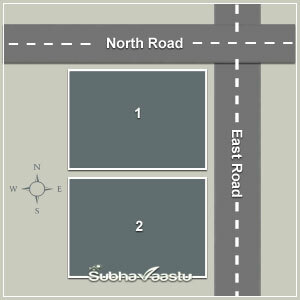 Vastu for South facing house, some says its not good to buy, why? Some says Vastu is not works for Apartments and flats, is it correct? What things we have to see first, while open our eyes bed after sleep? We just look to buy a Southwest property, any danger to sign the contract? Some informed that Southeast house it is not good, can I leave ir or can I buy? WE bought a land the length of the land runs along the public road and the width runs in the street facing east. It is a corner lot .According to the government rules we are to cut in land on the north east direction.I would like to know where to place the gates. I need two gated one on the east side in the street n one on the north side facing the public road.I would like to know how I should place the gates. What should be done to the cut in area on the North East side. Thank u .
Dear Sir, like to know more about East facing flat vastu. Can we buy it. had little doubt, because the backyard is the West and its totally open. Please explain sir. I bought an East facing flat which has perfect vasthu in 2011. But from the time we stepped in we don't see any sort of growth on professional and financial front. and now we are in deep debts. i was born in Sethabisha nakshatra .Few of our friends are saying that any one born in sethabisha nakshatra should not stay in East facing house and should transfer the ownership to some one else in the family. But as I have taken the house on loan , I cannot transfer to my wife as she is not employed. Please suggest some remedy for this to help. Dear team, many were stated that Vastu for East facing homes are excellent to buy, but we did not get any improvement in East facing home. Prior to join this home, we were in South facing, there we experienced luck, improvement, health etc. Unfortunately with one of the known person guidance we joined this home, he stated that as per our horoscope and names East facing is supporting direction. But troubling many things. This property has huge open space at backyard. Please help how to leave this home. we are ready to pay for your professional charges. My house in east side road facing house and my house backside (means west side) township compound wall is there. But outside of compound wall , T - road is there and which is hitting west-south corner. Is there any impact for us and how to correct it. Could you please give us suggesions on this. dear sir, just find one home which has more open space at backyard and accessible space towards east direction, we moved to california, we need to buy, here we found homes were going hotcake, how to get your suggestions on this property which has NE garage, is it good to buy. many says that garage at NE is not good. but here we found many homes were like this only. is this auspicious to buy. Respected sir, where should be the gates for East facing home vaastu, please send me answer to my email id, thanks in advance. సురేష్ గారు నమస్తే. నా పేరు కుమార్. గృహము కొనేముందు పేరుబలం మీద మరియు జాతక బలం మీద ఏ దిక్కు మంచిదో తెలుసుకోవాలని దాదాపుగా ఆరు మందిని సంప్రదించాను వీరందరూ చెప్పిందేమంటే నాకు తూర్పుముఖ గృహం చాలా మంచి చేస్తుందని తెలియజేయడంతో నేను రెండవ ఆలోచన లేకుండా 20వేల డాలర్లు అధికంగా డబ్బు ఖర్చుపెట్టి ఇంటిని కొన్నాను. ఇక్కడికి వచ్చినప్పటినుండ ి భయంకరమైన కష్టాలను చూసాను. తూర్పు చాలా మంచిది అని తెలపటంతో వెనక ముందు చూసుకోకుండా ఇల్లు కొన్నాను. కొనే ముందు ఒక్కసారి మీ వెబ్సైటు చూసి ఉంటే, నాకు ఈ కస్టాలు ఉండేవి కాదు. ఇండియా లో లాగ ఇక్కడ కూడా వాస్తు పని చేస్తుంది అనుకొని, అమెరికాలో ఇల్లు చూసే అలవాటు లేని వారి ద్వారా వాస్తు సలహా తీసుకున్నాను. సర్వ నాశనమైపోయాను. ఇక్కడ అంత సులభంగా ఇంటికి వాస్తు మార్పులను చేయలేము మరియు, ఇంటిని సులభంగా అమ్ముకోలేము. ఈ కష్టాలనుండి బయట పడేయండి. కాసేపట్లో మీకు ఫోన్ చేస్తాను. 2 దినాల క్రితం మా స్నేహితుడు మీ గురించి తెలపడం తో మీ వెబ్సైటు చూసాను. విషయాల ను ఎంతో బాగా తెలియచేసారు. మీ కష్టం ఊరకే పోదు సర్. ఇక్కడ ఎంతో మంది మీ వెబ్సైటు గురించి చెపుతుంటే, ఏమో అనుకున్నాను, చూసాక తెలిసింది, వారు చెప్పింది చాల తక్కువని. మెనీ థాంక్స్. Sir, I bought 30x65 plot. I a thinking of constructing house leaving some space in the front for gardening and parking. So i just wanted to get expert vastu for the directions of 2 bedroom with attached bathrooms,kitch en,Living room,Puja room. May please guide me accordingly. sir, I just checked one East facing plot, need to know about vastu for east facing plot. Its 30X39 can I buy it. Guruji, I have bought East facing flat and having issues after purchase. this is having 6 doors and 6 windows and one iron gate at East South gate. please guide if any changes are required. Note: total 7 doors if we include main gate also, otherwise its on only 6 doors. Need your support in buying the East facing house plot. Please share your email id, I will attach the floor plan. Your website is sensationally amazing. We are knowing many things through your website. I read that you are doing free services to the Indian military, my salutes to you suresh ji. many many thanks. Respected Suresh JI, I would like to buy a flat. Pl. tell which face suits me and my wife. My birth star is MRUGASIRA & WIFE's IS KRUTHIKA. Both propose to take loan. Hi! how to select a good homes with your indian vastu shastra, how to finalize things, do we have had your distinct consultancy or shall we proceed with this content posted at this site. I am confused selecting east facing property with basement. just now my hubby Jack sent you one email with our requirements. please help us, we require peace at home.